Hey guys, I often get asked about introducing new dogs to your house/pack. There are many approaches to create initial introductions (walking together for example), but I wanted to share my best secrets for creating long-term, full comfort when new dogs are freely interacting and living together. Dogs want and need to know a few things so they can be comfortable. They want to know what the other dog is about. Does she mean me harm? Is he someone I can trust? Am I safe? Do you belong here? What’s your story? Are we going to be friends or enemies? It’s your job as their leader to create the environment and the state of mind, throughout your pack, which will allow positive, tension-free relationships to flourish. Most of the issues I see that go down with new dogs being introduced to each other in the home are totally avoidable and stem from dogs being let loose far too quickly, in a chaotic, stressed, nervous, and excited state to figure things out on their own. Dogs in these states are ripe for the fighting and bad-choice-making. And here’s the thing, once dogs have had a serious squabble you’ve got a very good chance of a grudge and long-term distrust being created. That means lots of trouble and tons of work to even attempt to resolve it and create harmony again. -Don’t be in a rush. Take as much time as needed. This could be two days, two weeks, or two months. It all depends on the dogs. But I want to make sure you understand the time parameters I’m suggesting as possibilities. -Teach all dogs in the pack the basics: Walk politely on leash, be polite at thresholds, wait calmly for food, have a rock solid “place” command, be polite around humans and their space. -Get ALL dogs (not just the new guy!) used to being consistently in a good, relaxed, obedient state. Crazy, disobedient, “out of their tree” dogs are just asking for fights with the wrong dog. -Have dogs learn to simply exist around each other. Being in “place” is a great way for dogs to very comfortably get used to each other’s presence without the pressure of having to make decisions about each other. (Decisions = stress. Stress = bad choices.) 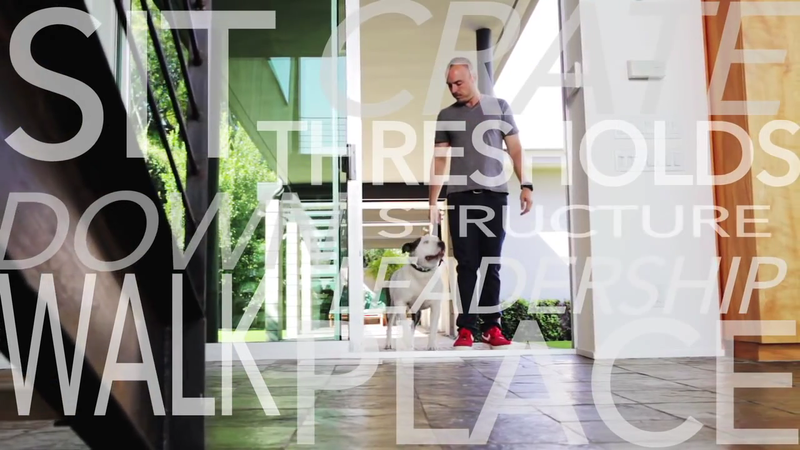 Consider mutual “place” commands as a low-impact meet and greet. You can slowly add more movement with one dog at a time and gauge the reactions to see your progress. -Be patient! And when you think you’ve been patient, be patient some more. 🙂 You’re going to have these dogs for a long time, there’s no rush to create magic instantly. -Keep excitement, affection, and chaos to a minimum during the initial period. All of these things can create stress, competition, tension, and fights. -Use crates to ensure all dogs are safe when unsupervised. Do not leave dogs alone together who are new to each other. Many things in the home can trigger excitement, stress, competition, and ultimately fights (doorbells, delivery people, squirrels etc) even in your absence. -Use crates to have dogs simply get comfy around each other. You can crate dogs near each other and help remove novelty, uncertainty and concern. But you have to ensure that that all dogs in the crates are practicing awesome behavior. If one or more of the dogs are stressed, barking, whining, carrying on, trying to escape, panicky, demanding or bratty, then you’ve got a recipe for disaster brewing. (Imagine living next to the worst neighbor in the world and how stressed, angry, and unhappy that makes you feel. Same goes for your dogs.) If you can’t ensure great behavior, crate in different rooms. -Walk the dogs together. They don’t need to be right next to each other to benefit from the walk together. As they show more comfort in each other’s presence you can slowly close the distance. -Be careful with play and toys. As you get more comfortable, remember that dogs who are cool with each other in one context and environment can lose their cool when excitement and competition (toys and play) are introduced. Watch for tension and serious intent and address/diffuse it quickly. 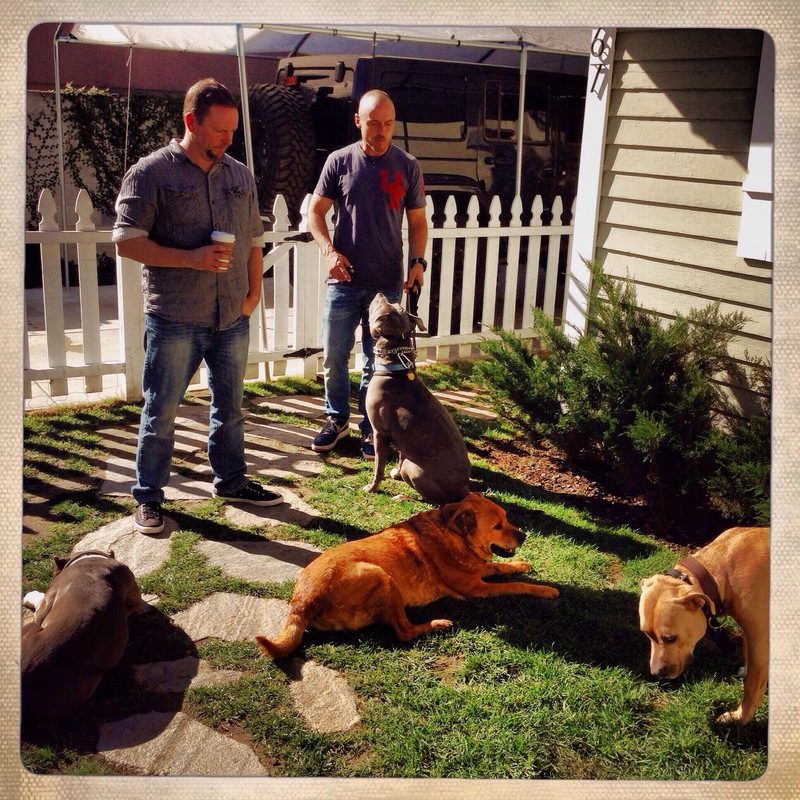 -Here’s the big Kahuna: Dogs are constantly assessing each other and you. If one of the dogs (doesn’t matter if it’s the new dog or your long-time dog) sees the other dog or dogs misbehaving, being bratty, out of control, pulling on leash, barking/being reactive at other dogs on the walk, demanding attention from you, guarding space or objects, barking in the house incessantly, able to push into your personal space, and that you the human do not have control of and over him, you have another recipe for disaster brewing. Just like you see a dog that is out of control and say “good grief, what an annoying, out of control, dangerous, pushy, little so and so” so do the dogs in your life. If you won’t create and demand polite, respectful, comfortable, courteous behavior, then you can be almost guaranteed that one of your dogs will. Take control, create a respectful, calm, and polite environment and all the dogs will feel more comfortable and they will thank you with nice, non-fighting behavior. If you know you’ve got a dog that isn’t perfect and has some issues, follow these recommendations very closely, be super patient and prepared for a longer haul. Watch the dogs to see how the comfort level looks, and then you can assess where to move from there. If you have an easy dog and you’re bringing a new dog in, use these recommendations as well, and watch your dogs. They will tell you (absence of tension, staring, side-eyeing, growling etc) when they feel comfortable and ready for more freedom and interaction. Our groundbreaking do-it-yourself training video/PDF training booklet Learn to Train The Good Dog Way: The Foundation is now available for pre-order at a discounted price – click HERE to order your copy! I wish I had done this with our pack and when we added our last pack dog. We do it now and its become our way of life now so its simple. However, our last pack dog and our first pack dog DO NOT get along and we have decided to create harmony, and peace in our home with our 8, to just avoid these two ever seeing one another and its working great. Its not what we would have chosen but there is no way they are going to get a long since that first episode it just kept exploding and creating too much stress. Now, all are happy, feel safe and we feel for us, this is our best option and it works for us. They live in the same living area but we just have boards up on one side of each of their crates so when one is out, they do not see the other and vise versa. Simple, cheap remedy and now our home is finally PEACEFUL. There is no perfect scenario for all situations and re-homing our last dog was not an option for us. He was saved from death row and we were his 3rd home. Your blog is so correct , thank you for sharing. We did do it slow but we did not do this training 100% nor was their structure. Now there is all the time. It can be done and yes, in the beginning, was VERY stressful, upsetting and crazy but once we decided to just let them live separately, dogs and humans live peacefully now and we have well behaved, structure and a chaos free home. This is the only way to do it if you have multiple canine’s. Even with one, you must have structure. Great blog and so vitally important! YES, YES, YES!!! I have three large packs (personal dogs and 2 packs of foster dogs) and do all these things. I cannot emphasize enough how much PATIENCE to allow the dogs time to be ready and the prep work makes a difference to having a happy outcome. All but one are bully breeds and this keeps everyone happy and safe. THANK YOU! You need to be a little more specific and by that I mean a step by step guide on what to do from the moment you pick the new dog up. Do I introduce the new dog to the others outside? Do I crate everyone from that point on? Do I only crate the new guy? I am fostering a rescue dog that was in a shelter..At first he was not having any changes..he was starved…then thrown into a shelter they did a drive by of meds and neutering on him..and then I picked him up and took him home..he is crated most of the time due to major KC..which they told me he didn’t have..the pain from the neutering and having no food in him have subsided..the pain is gone and he gets fed 4 small meals a day to build him up..he has calmed down tremendously but still at times..while in the crate..he tends to growl lowly when he sees my little chiweenie dog..I want to eventually introduce him to her but not until his KC is gone completely..I’ve been able to handle him a lot..including giving him cough medicine..he stand 5 feet away and sits until he is commanded to eat..he is very polite but sometimes when I am walking him..he is just toooo alert…like a staring type of alert..I am still trying to figure out if he is getting use to being in population of people or if it’s another issue..I was able to give him a bath with no trouble..he sits on command..he downs on command..I am just a little concerned about the introduction..Because eventually he will have to be with a new family and possibly other dogs..what would you suggest..I do feel that he feels trapped when he is in the crate and the little dog is not..this could be one problem..
Hey Edie, thanks for the comment. Personally I would focus less on the introduction of the two dogs and much more in the foundation/state of mind training for your new foster. If you work on the foundation you will likely see many issues simply disappear. Those that don’t completely disappear will much lessened in intensity and should be much easier to work on. Go to my website and and click on free do it yourself videos. If you work on all those exercises you will see some pretty amazing changes in your dog. http://Www.thegooddog.net. I have learned ROUTINE is very important as well. I wish I would have known this before. We have a 3 year old that is super sweet, calm, and quiet and raised with two other dogs that were older than him. The older dogs passed away a year apart. We brought in 2 boxer puppies and didn’t think he would have a problem since he grew up with two other dogs and was always playful and loving. From the beginning he made it clear he did not like the female puppy. We separate them during the day and during meal times. We keep them together when we are home. We make sure the older one is pet and loved so he knows he isn’t being replaced. Every now and then he gets very angry at the puppy now 3.5 months and gets very aggressive; no blood thank good ness. But she is visibly shaken. We constantly talk to them all and pet them all. They all get treats together so no favoritism is shown. We want him to know they stay and they all belong. Patience is what we have. Hey Deborah, thanks for the comment. I’m sorry you’re having problems with your dogs. The first thing I would recommend is for you to become aware of how much petting and loving you’re sharing with your dogs versus how much structure, rules, leadership and training you’re sharing with them. Petting the older dog to ensure that it knows it is loved isn’t necessarily helping your situation. Affection can become something dogs will fight and guard over – and it reinforces whatever state of mind you’re dog might be in at the moment. So if your dog is feeling jealous or nasty towards your other dog and you pet and love you’re creating jealousy and nastiness – so try to be keenly aware of what state he’s in when you pet. And if your not sharing a balance of structure, rules, leadership and training, especially with three dogs and two of them being pups, you’re kind of setting yourself up for a hard situation. The female pup may be acting pushy, controlling, demanding or just too excited and your older dog may be correcting the behavior – especially if you aren’t doing it yourself. My recommendation is to al least if some basic foundation training to create a calm, relaxed, respectful, and safe environment. Your older dog may just be correcting the pup in a typical and normal fashion that could be actually ok or it could be something more serious. It’s impossible for me to say without seeing it. Make sure you’re creating a respectful and obedient household and you’ll likely not have issues, but if you only pet and love and let the dogs figure the rest out on their own you could end up with a serious problem. We are GSD owners,started with Chezney rescued @ 5yrs old 70lbs 2yrs later got GSD Kramer @ 2yrs, we had to put chezney down this past Aug @15yrs 😦 . so we rescued GSD Grace from TX, Dec 4. 😦 hw postive )5yr Kramer is a 100# boy and when we got him we new he would out grow Chez so we let her dominate him great 8yrs together our Chez taught Kramer so much. Now with new girl (85lbs) Kramer is letting her somewhat dominate, will pause and not walk past if Grace crowds him in or out of doorway(teaching her not to crowd) but it is clear he will back off somewhat, however sometimes in crowded place they can get pretty riled up,Easily broken up ,happens maybe 1@ week not even that much really. I’m home full time til spring . That’s why we got her Dec cause I don’t work winter. We do not create at all. Other than crowding and what seems to be an always hunger ( I control food time closely and its getting there)we do alright except for this crowding and not playing together to much. Kramer older 10 now that’s why we made sure new one was at least 5, so would keep him active but not worn out. These dogs are walked regularly weather permitting (Kansas) very lg fenced in yard dog screen so plenty access when I work. So do you think this crowding and Kramer backing down will work its self out am I on right track. Grace was a breeders throw away great with my Grand daughter ,I have trained her not to take food from toddlers hand and only took 1 day yep I was firm from start. I’m the pack leader ,but this crowding thing is going slow and will Kramer always then let this female dominate?yes still on HW treatment so now no walks for Grace but still doing ok.I tell kramer all time move her outta way but he shows no concern about it , he was very depressed after Chez crossed bridge. Hey Julie, I’m personally not a big fan of letting dogs work issues out on their own. I much prefer to set the rules and be the only enforcer. It removes stress and conflict. The more you allow the crowding to continue the more you allow tension to increase. I would address them any time you see tension, even the smallest amount, and address it to let them know you’re handing things, not them. My dogs are all rescue dogs. For a while now, I have been using different homeopathic sprays – Post-Trauma Stabilizer, Grounding Green (to strenghten the body-earth connection and several others for healing or balancing. Its amazing to see, the dogs that are “balanced” refuse to lick it off my hand, the ones that have issues, love the sprays. Isabella, that’s fascinating stuff. A is for sharing that with everyone. You never know what’s going to be helpful. How would you deal with a dog who has resource guarding issues. My 8 year old Sibe only does rhis with her food. She stares down the cats and when they approach her she growls but doesn’t attack. I noticed she has been doing this with our 4 year old son and he just walks past her. She doesn’t growl at him just hovers over her food and slowly nibbles it. Any suggestions? Hey Roz, the first thing I would do is to feed the dog in a crate or other room always from the cats/child and other stress triggers in order to prevent building more issues, and keep everyone safe. I would also want to go after the issues to ensure there’s no guarding fallout towards your son or cats down the road. I would hire a balanced trainer who familiar and successful with dealing with these issues. I can give you a recommendation is you like. What an amazing article!!!!! Thanks!! I would like to have your permission to link this article to my website. I found a good piece of advice before any dog comes into your home. Get a T-shirt that has your scent on it, rub it on all your dogs at your home. Before the new dog comes into your home, rub the T-shirt on him/her (the longer the better). Your dogs will smell the familar scent on the new dog and it may be an easier transition. I think I will print this and hand out to new adopters through the rescue I volunteer for. I follow these guidelines when bringing GSD fosters into my home that has a reactive GSD and 3 cats. Michelle, fantastic! Glad you found it useful. 🙂 And love the idea of you helping others by passing this info along. 🙂 Thanks! I volunteer for S.H.A.R.E. Shepherd Help and Rescue Effort Inc. We are considering linking this article onto our new website when it us ready. The first 2 weeks is when we usually find out if the adoption will work. we can to get dogs back because people did not using basic common sense on integrating a new dog into the house. I try to spend a good half hour explaining how to do it but if it’s not in writing they don’t pay attentionas much. I effectively use many methods of yours including prong collars. How do you handle the dogs that know when that collar is off? Or does it stay on the dog until a certain point? Hey Ashley! Thanks for the comment and great to hear that you’re having success with some of the methods I’ve shared. As for the collar off, I recommend you leave it on the dog for a considerable amount of time for patterning. (How long depends on the dog, but it might be a few months.) After that I like to go to a shorter handle leash – the dog knows when he has a leash on and how close you are to being able to correct him/her. By going to a shorter leash you start to create the idea of no leash but you are still able to correct. Later I’ll remove the short leash and just leave the prong on and correct using my hand on the prong. Once gains this helps the dog think he’s not wearing anything. For really tough, super challenge dogs, e-collars are the very best thing. It really impacts the dog psychologically when they realize you can correct and influence them at a distance. Ashley, great to hear you’re having success with some of the approaches I’ve shared. 🙂 As for the collar coming off, it can be challenging with some dogs much more so than others. But, we’re looking to keep the collar on long enough and consistent enough that the dog becomes patterned to the behavior. But, some dogs will need convincing with the collar off as well. I use e-collars with my board and train clients after we do prong work because it circumvents that issue so well.